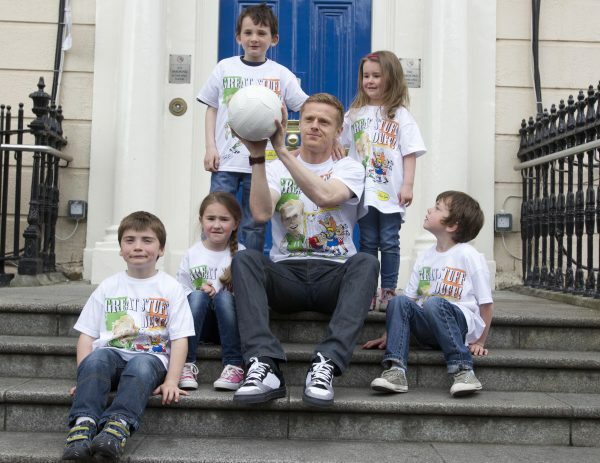 Penneys has teamed up with Irish football legends Damien Duff, Robbie Keane, John O Shea, Shay Given and Richard Dunne to create five exclusive football t-shirts in aid of Crumlin and Temple Street Children’s Hospitals. The limited edition t-shirts, which feature each of the players in a humorous caricature, go on sale at Penneys stores this week. Damien Duff is pictured with friends of Crumlin and Temple Street Children’s Hospitals to launch Penneys limited edition t-shirts ahead of Irelands Euro 2012 campaign in order to raise much needed funds for the sick children of Ireland. Speaking at the launch, Denise Fitzgerald, Fundraising CEO, Temple Street Children’s University Hospital said “This is a fundraising initiative that we are truly delighted to be involved with. Now more than ever Temple Street Children’s Hospital requires much needed funds to go towards vital lifesaving equipment that helps save the lives of thousands of patients each year. Thank you to Penneys, Today FM and our Football legends for their continued support”. Joe Quinsey, CEO of the Children’s Medical & Research Foundation at Our Lady’s Children’s Hospital, Crumlin commented “We are delighted with this incredible support to Fix Crumlin from the Irish European Championship team, Today FM & Penneys. Our Lady’s Children’s Hospital, Crumlin is also a world class player when it comes to delivering care for our kids but they deserve quality facilities to match that care. Every year Our Lady’s Children’s Hospital treats 130,000 children. We carry out 550 heart surgeries. We care for our children fighting aggressive cancers. But all these tough life struggles are happening in cramped and out of date facilities. This has to change. When people buy these T-Shirts they will help support our drive to Fix Crumlin and deliver world class facilities for our sick kids with cardiac and cancer conditions”. The charity football t-shirts will retail at €6 for adults and €5 for kids in all Penneys stores. Established in 1872, Temple Street Children’s University Hospital is a national facility that provides paediatric care to children from all over Ireland. Each year, over 130,000 sick children are cared for in Temple Street, of which one-third of inpatients come from outside Dublin. The Accident and Emergency Department caters for almost 50,000 children annually, making it one of the busiest A&E facilities in Europe. Major specialities at Children’s University Hospital include Neonatal and Paediatric Surgery, Nephrology, Neurology, Neurosurgery, Craniofacial surgery, Orthopaedic, ENT and Plastic Surgery. Every year at Our Lady’s Children’s Hospital, Crumlin treat 130,000 children. The 265 beds facilitate 26,500 in-patients and day care patients. Over 31,500 children are treated in the emergency department with 80,000 children are cared for as out-patients. 550 heart operations are carried out. No critically ill and terminal cancer patients have a private room. No cancer patients and their families have a private bathroom. Parents of very sick cardiac patients sleep on cramped corridors and wards.